To round up this mini-series on Rome, here are some suggestions on where to stay, eat and drink in the Eternal City. I have increasingly started opting for BnBs and apartments over hotels when I travel. I find them not only cheaper than hotels, but they give a greater chance to experience ‘living like a local’, even if you spend just 3-4 days. Most apartments do not offer breakfast, so it gives you a chance to step out to the local ‘bar’ and have a coffee with your neighbours. You head to the local market to buy groceries to whip up dinner. 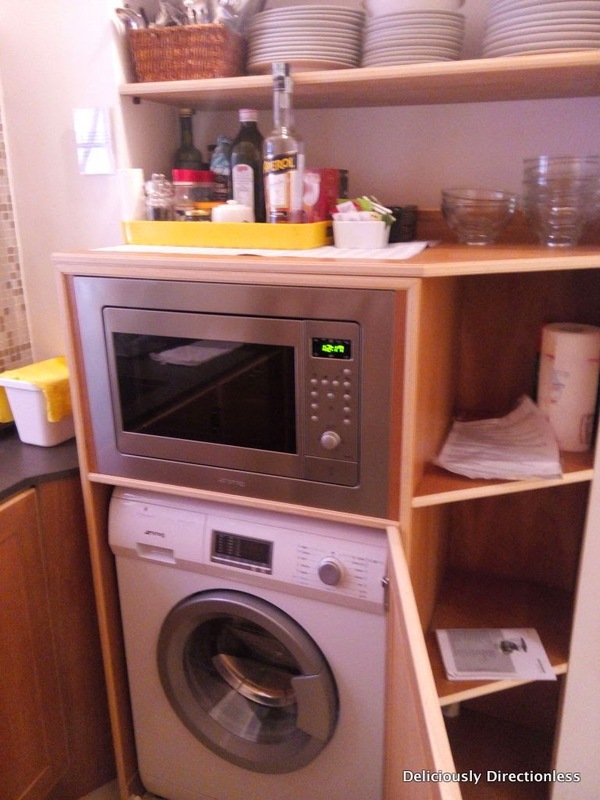 You don’t have to pay through your nose to get your laundry done, you can refrigerate your pizza dinner & microwave it the next morning (most apartments have full or partially equipped kitchens)… And whether your hosts are present or absent, they usually have great tips on the best places nearby to eat, drink & be merry. 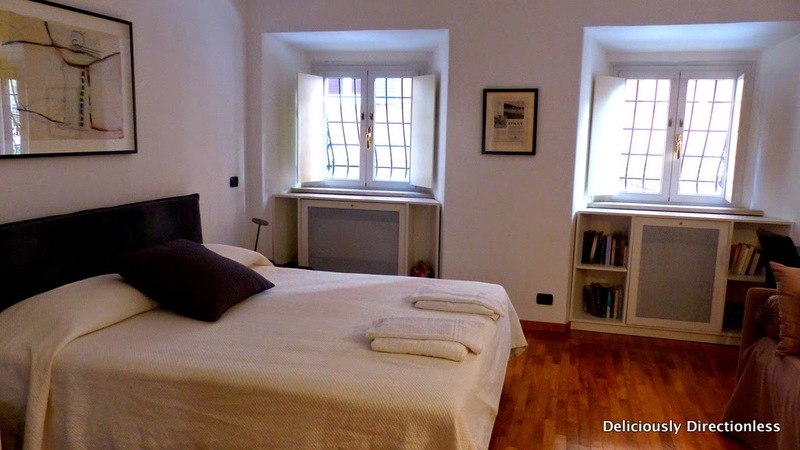 This time around in Rome we spent 2 days at our favourite little BnB (in a residential area, away from the city centre), and 2 days in an apartment bang in the middle of the action – in the Spanish Steps area. 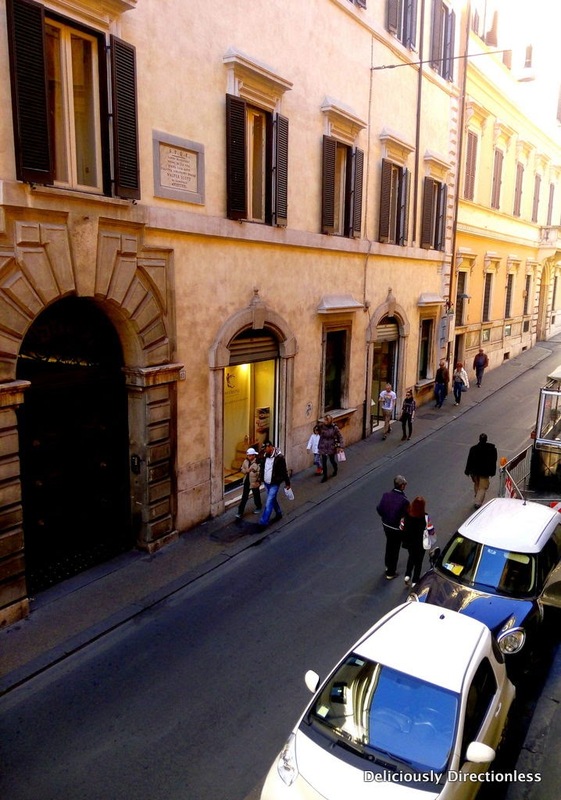 In fact the place is called The Spanish Steps Apartment and it is literally a 3-minute-walk to the historic steps. 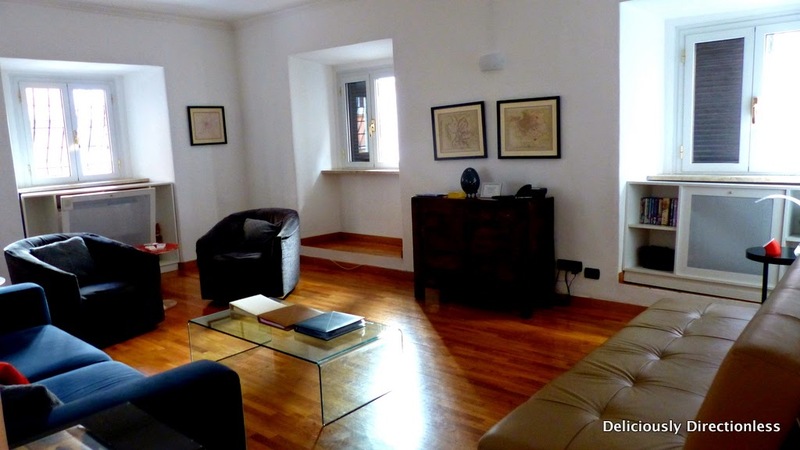 The apartment is on Via delle Mercede, in a renovated Roman palazzo. We obviously occupied the master bedroom, which had a large bed, a couch, and lots of storage space. 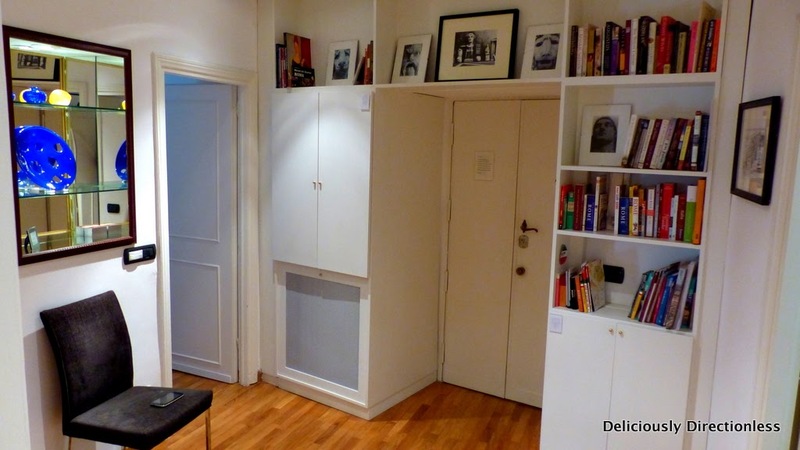 There’s also a laptop hooked up to Wi-Fi, or you can use your own devices on the free and fast Wi-Fi – available in most parts of the apartment; the signal was weak in the kitchen, which is at the far end of the apartment. 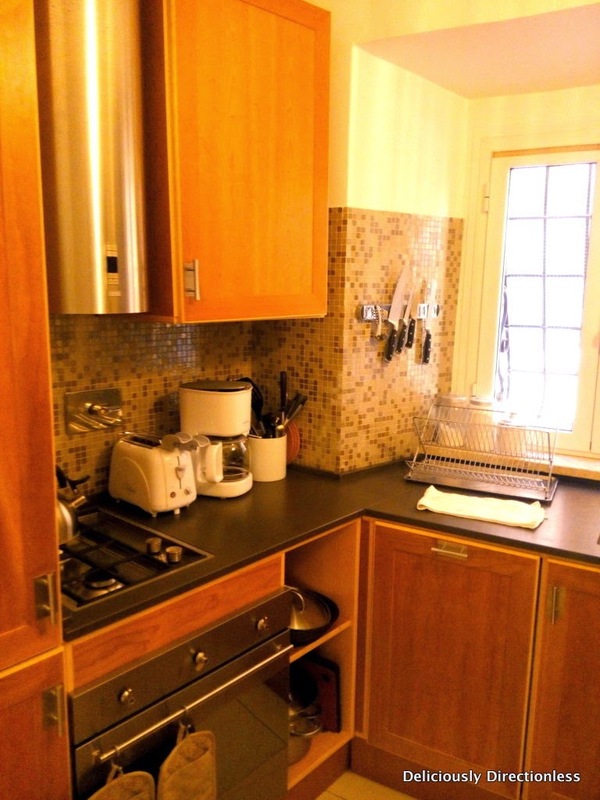 The kitchen, done up in warm colours, has everything you’d need – hob, refrigerator, microwave, dishwasher, washing machine, oven, pots, pans, crockery, cutlery, some food items, and a bowl of fruits to welcome us ‘home’. The only thing we missed was having a bidet in the bathroom, as we were so used to seeing in bathrooms all over Italy! The apartment manager Rosie let us in and explained everything, and she was available on the phone promptly, throughout our stay (and even before it). The owner of the apartment, David Colin, lives in the US, but is always available on email, and the phone in case of an emergency. Of course we didn’t need to trouble him at all, as everything from booking to check-out was pretty seamless. 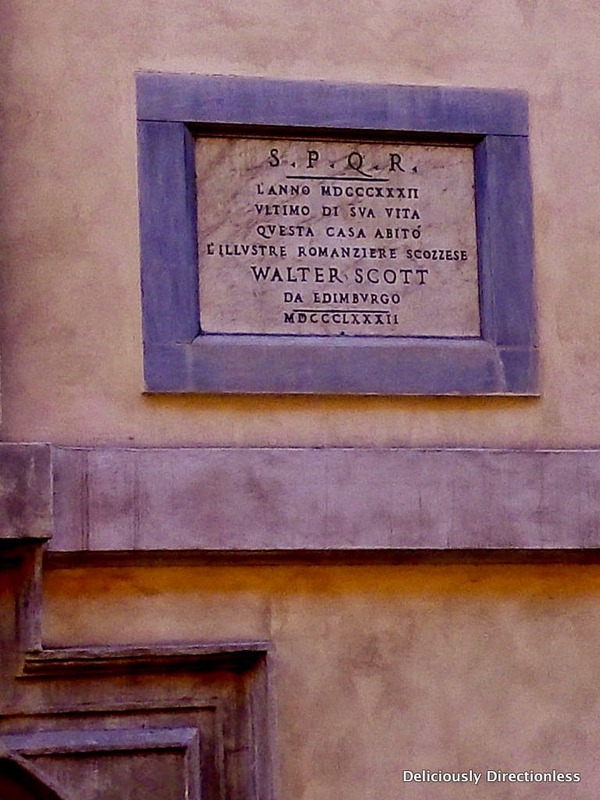 From the dining room (which has a six-seater table), you can look across the street and see the house where Walter Scott lived for a while. 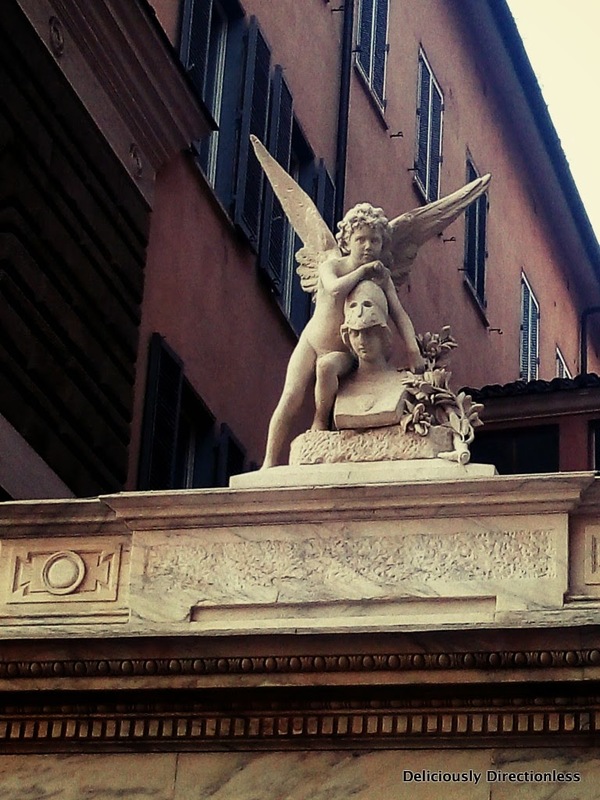 The famous sculptor Gian Lorenzo Bernini also lived on this street. Overall, I was pretty impressed with the apartment. 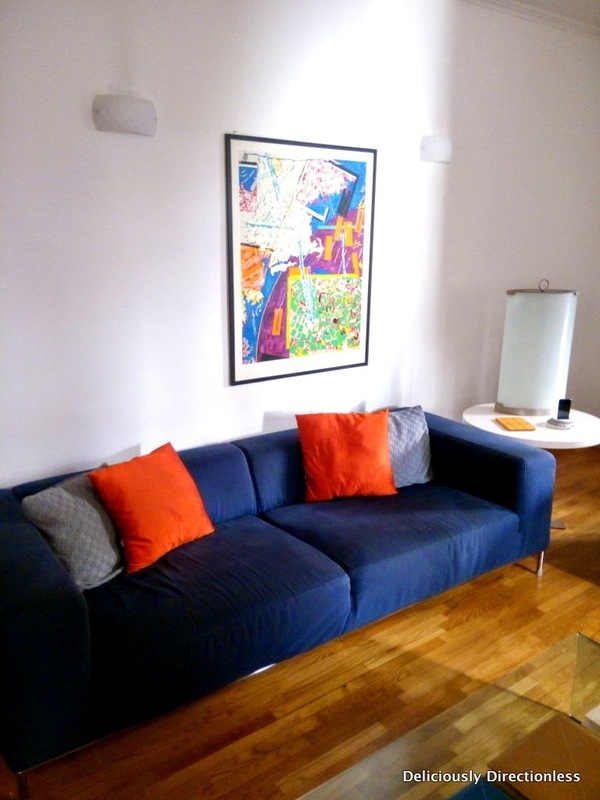 It’s so centrally located that you can actually walk to many of Rome’s attractions. 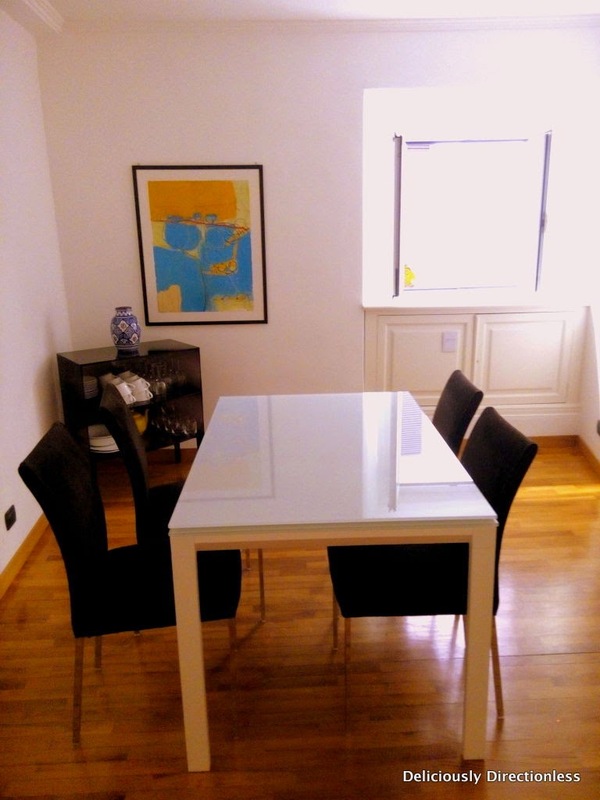 If you need to take the metro, the stations Spagna and Barberini are nearby. There’s the perpetually crowded Spanish Steps, with the Trinità dei Monti church at the top and Bernini’s Barcaccia Fountain at the bottom. The boat-shaped fountain has been recently restored and looks shiny new – not bad for something that was made in 1627! John Keats lived (and died) in a house near the steps, presumably soothed by the sound of the flowing water in the fountain. 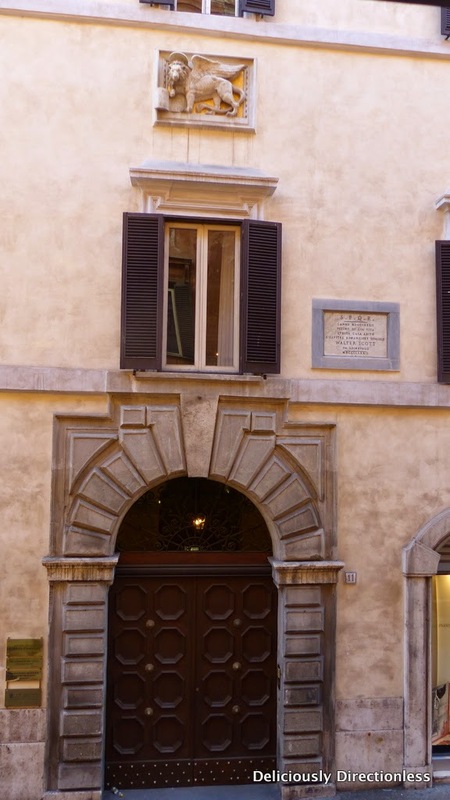 His house is now the Keats-Shelley Memorial House Museum. Another famous fountain, that 18th-century Baroque masterpiece Fontana di Trevi is also a 10-minute walk from the apartment. 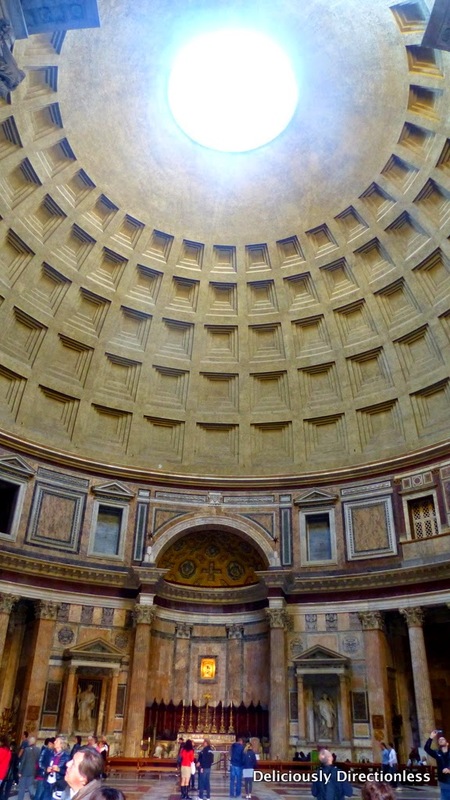 Go and drop a coin in it and you will return to Rome at some point in the future – it certainly worked for me when I tossed a coin in there in the summer of 2013! At the very least you’d be doing a good deed, as the money collected from here is used by a charity to subsidise a supermarket for the city’s poor. 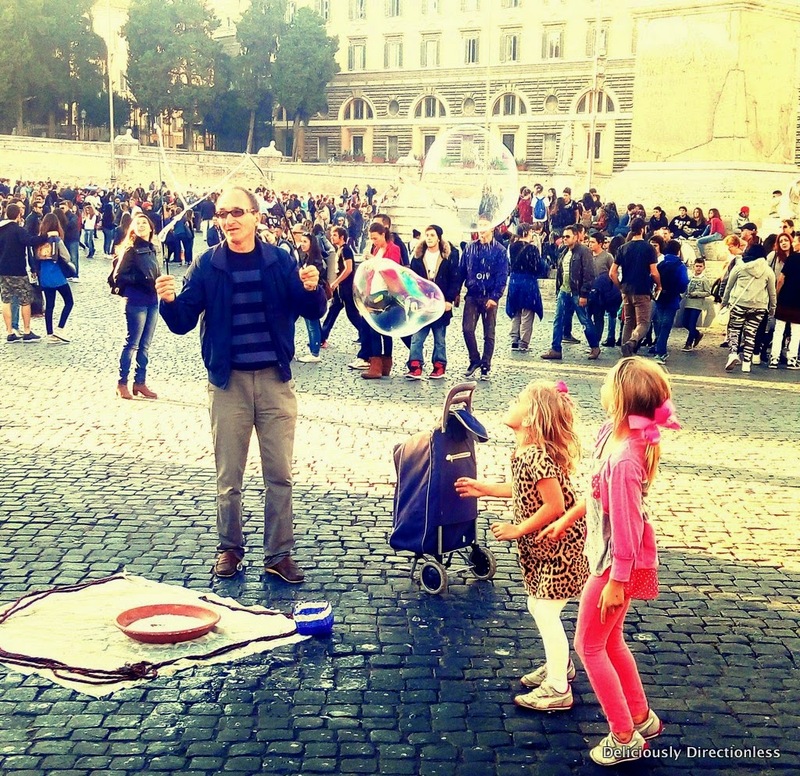 Another attraction that is within walking distance of the apartment is Piazza del Popolo – the people’s square, designed by Valadier in the early 19th century. 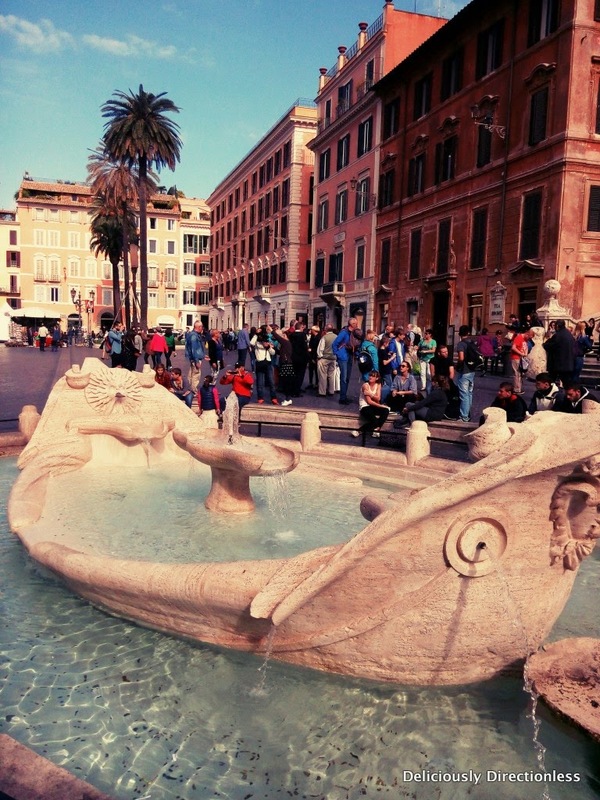 This elegant square is a meeting place for Romans and tourists alike and is surrounded by beautiful churches and fountains. 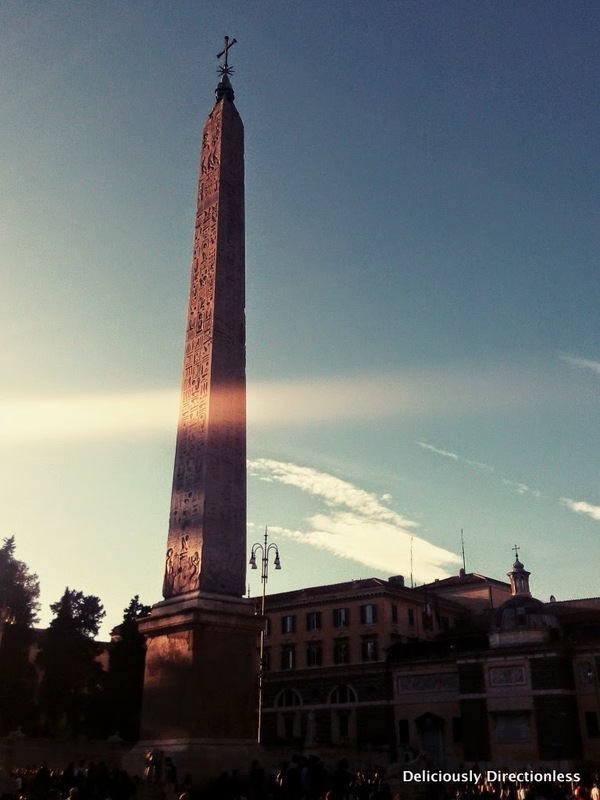 The most striking feature is the ancient Egyptian obelisk rising up in the centre – the obelisk was brought to Rome in 10 BC by Augustus, and originally stood in the Circus Maximus. 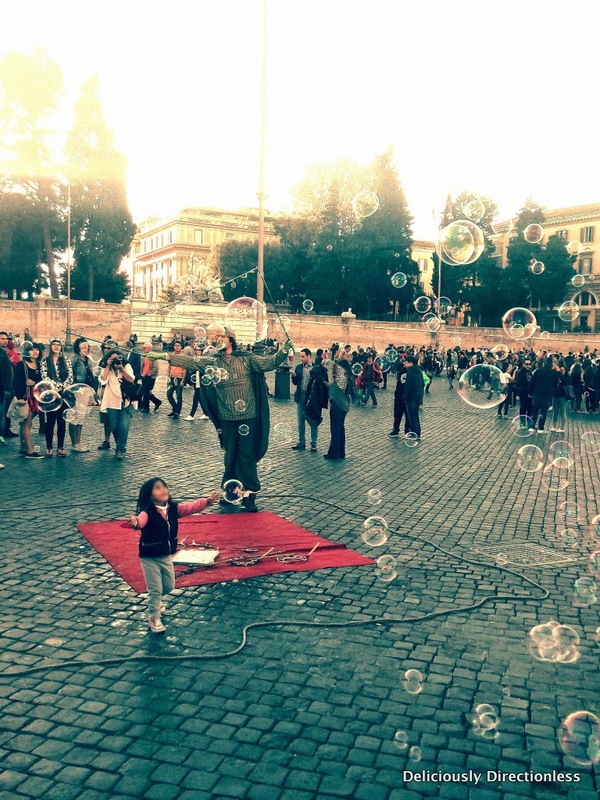 On weekends the piazza is quite crowded, with people strolling about, taking pictures, kids running around, and both children and adults being enthralled by the guy blowing soap bubbles! 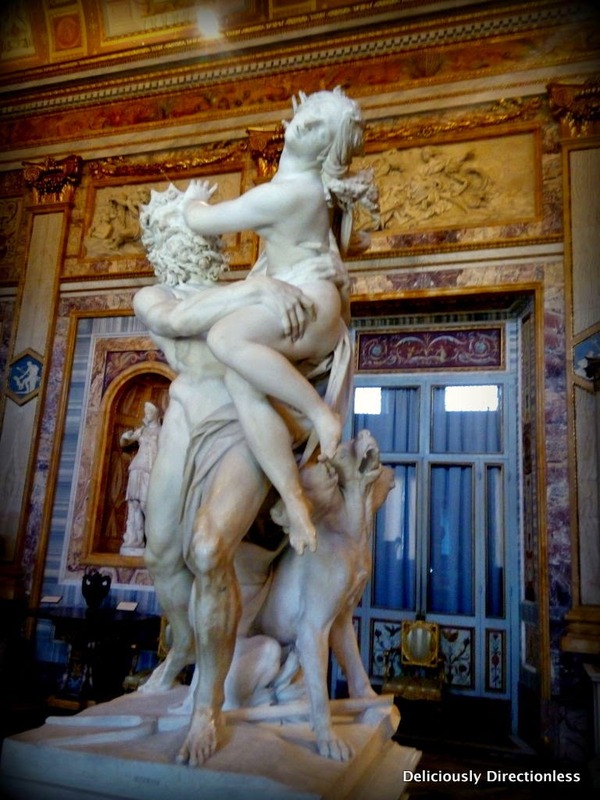 And a slightly longer (about 20 minutes) walk will bring you to the fantastic Galleria Borghese, set in the sprawling estate of Villa Borghese. 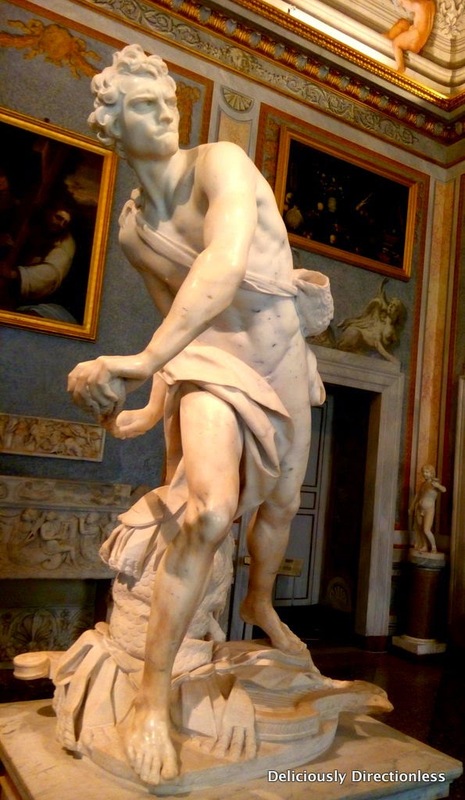 The highlight here is of course Bernini’s work – three stunning sculptures that look so lifelike that it’s hard to believe that they are carved in marble. The works are so elaborate, with a lot of attention to detail, and fluid movement (yes, even in marble), that they appear real. 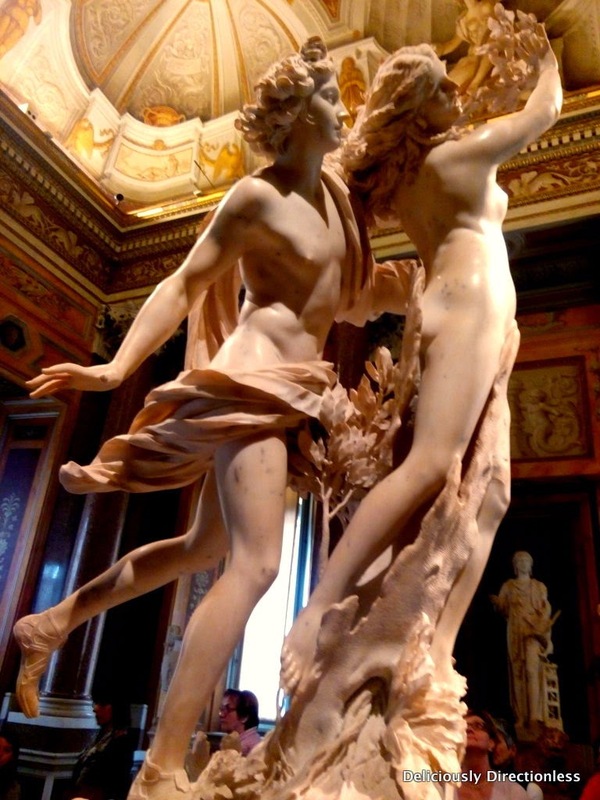 Apart from these sculptures, there are many important paintings by the masters – Raphael, Titian and Caravaggio. Even if you’re not that into art, the gardens of Villa Borghese are a delight to stroll in. Don’t miss it. 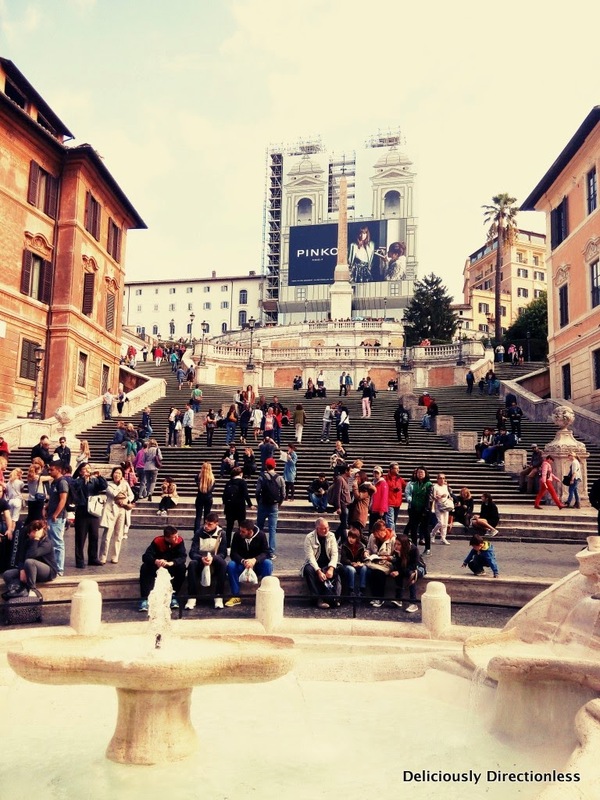 Spanish Steps is a notoriously touristy area so the chances of a mediocre meal are very high. I’d highly recommend Pizza Ciro, which is a few doors down the road from the apartment. It’s very popular with the locals as well, so get there early or be prepared to wait. 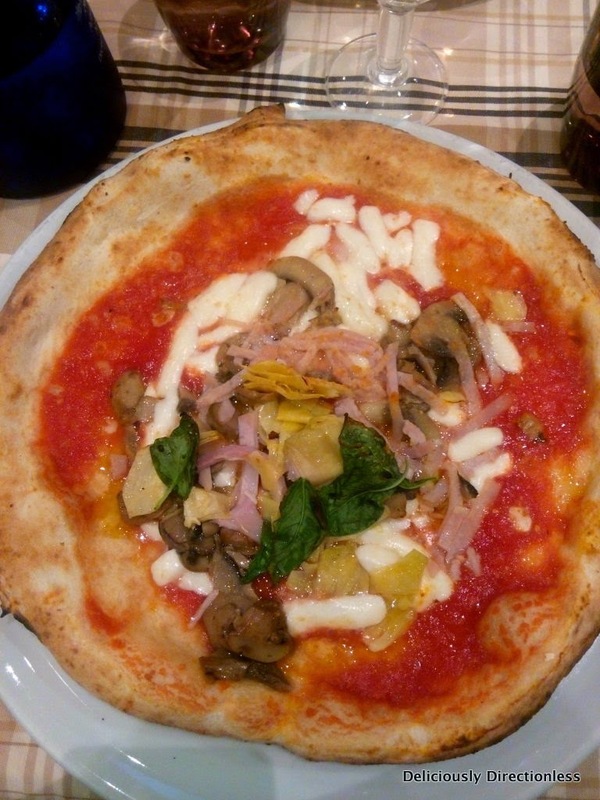 The pizzas here are fantastic – we had two pizzas (I went for the Capricciosa, with artichokes, while the husband had Diavola, with spicy salame), a glass of vino, and some sparkling water; the bill was only €23. In Jan 2014 the place was busted for laundering mafia money and was shut down. Now the money goes to a state-appointed trustee, so it’s quite all right to head there! 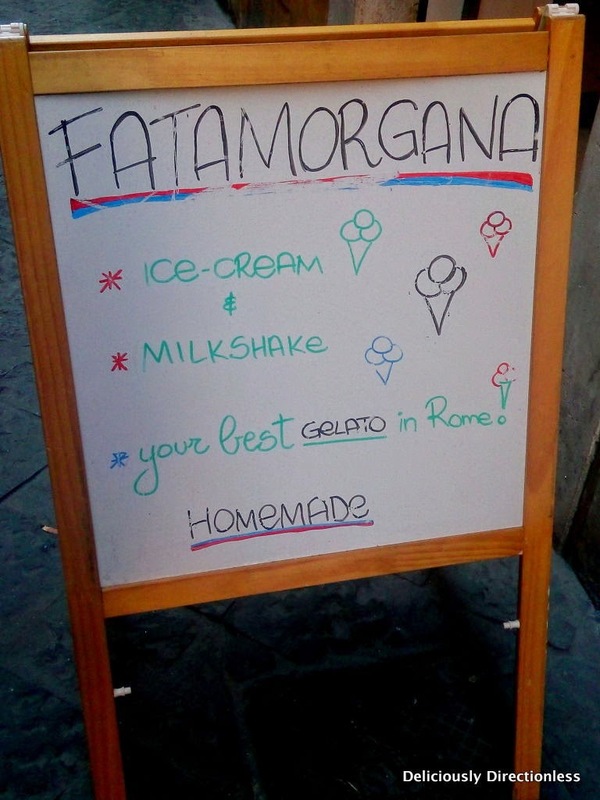 For gelato, I can’t recommend Fatamorgana enough! They have a cute little shop off the road(s) heading to Piazza del Popolo. With flavours such as Thumbelina (nuts, rose petals, violet flowers) and baklava (walnuts, almonds, caramel), can you really say no? 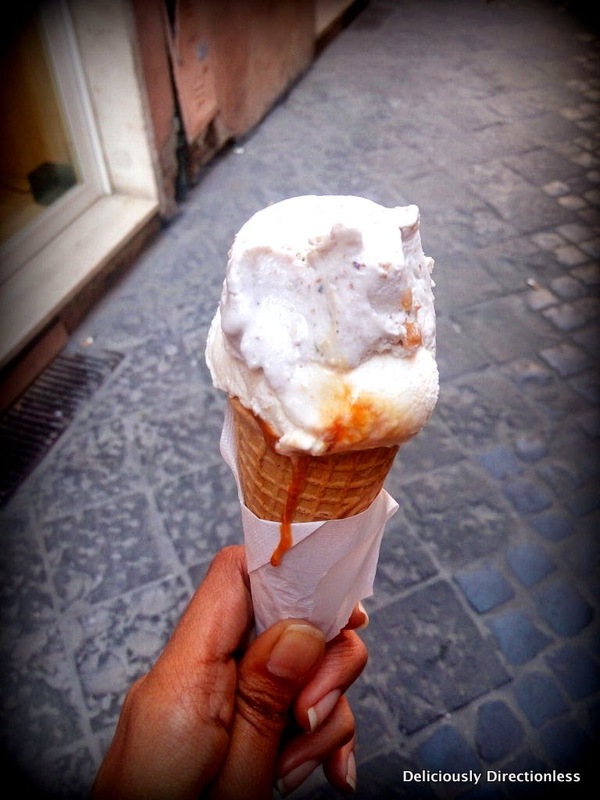 We used to walk down twice a day, grab a gelato each and head to the piazza – pretending we are Romans 😉 For more gelato suggestions, take a look at the list compiled by fellow blogger Maria of Heart Rome. There are plenty of bars around where you can drop in for an espresso. 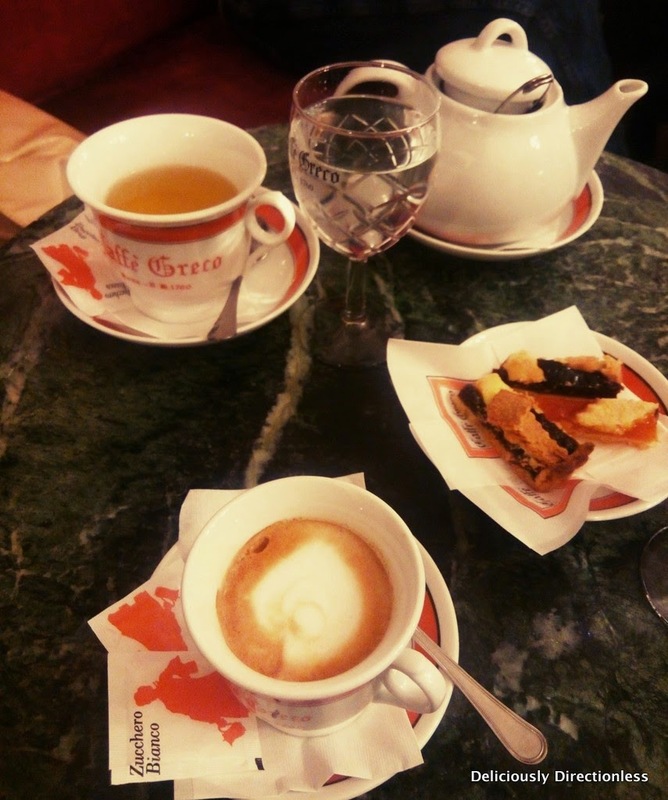 The historic Antico Caffè Greco, the oldest bar in Rome, is 2 minutes away, near the Spanish Steps. Of course the coffee is a bit over-priced, but you don’t mind spending a bit more for its old-world charm, sharply-dressed servers, elegant crockery and opulent rooms. Everyone from Byron and Keats to Wagner and Liszt, even Casanova have had coffee there! 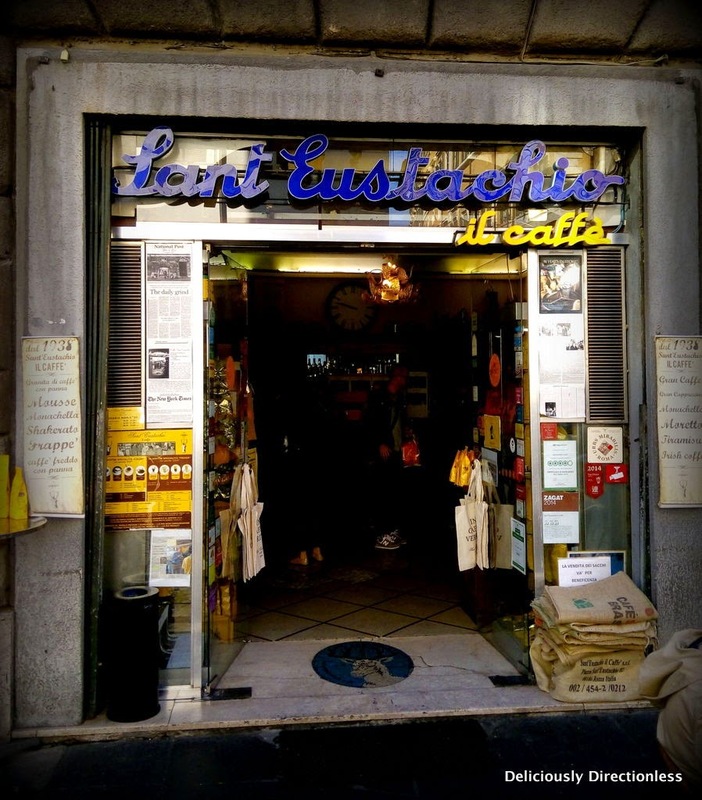 Another place I really loved was Sant’Eustachio Il Caffè, a bar near the Pantheon. It was established in 1938 and still retains the original mosaic flooring and the furnishing. The bar is known for its specially roasted coffee (very, very good), using fair trade beans. 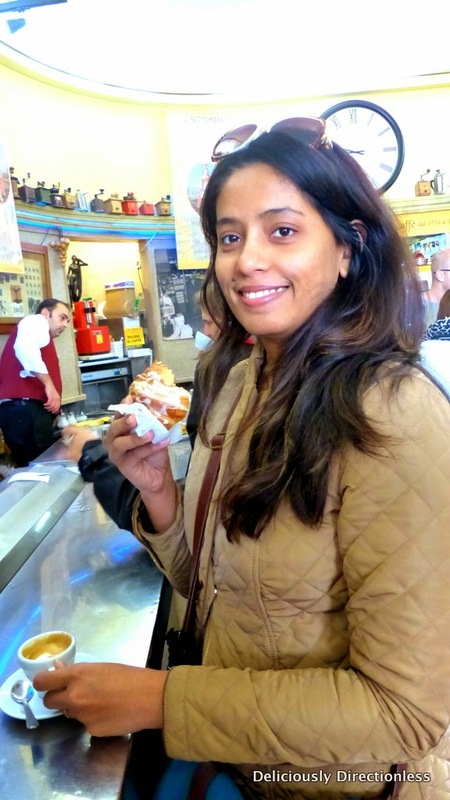 It was a lovely spot for some breakfast – macchiato and cornetto (croissant) – on our last morning in Rome. So that’s my mini-guide for Rome city centre. Hope you find it useful when you head to the city. And remember to look up when you’re wandering the streets; you might just spot something pretty! 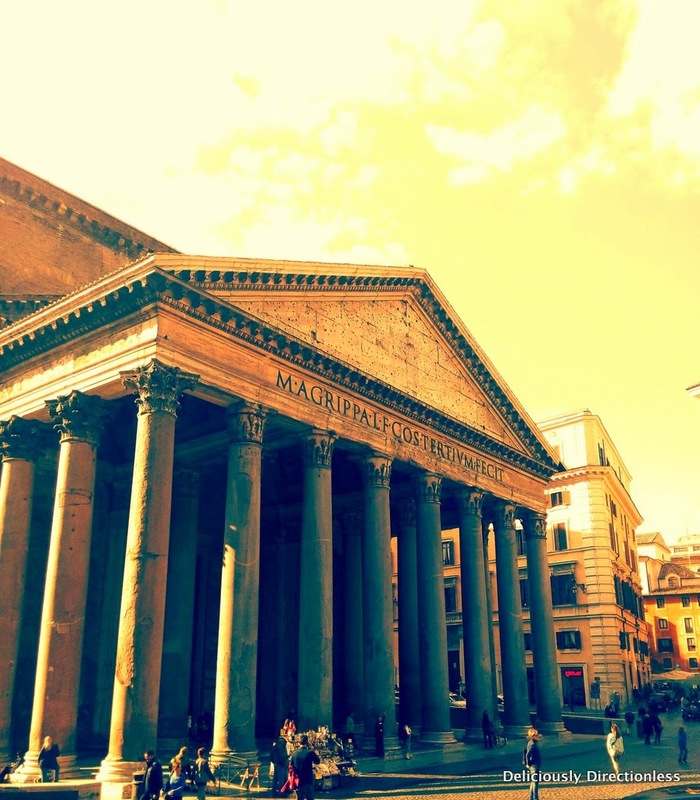 Heading to Rome this year? Have any questions or need more suggestions? Leave me a comment below and I’ll help you. 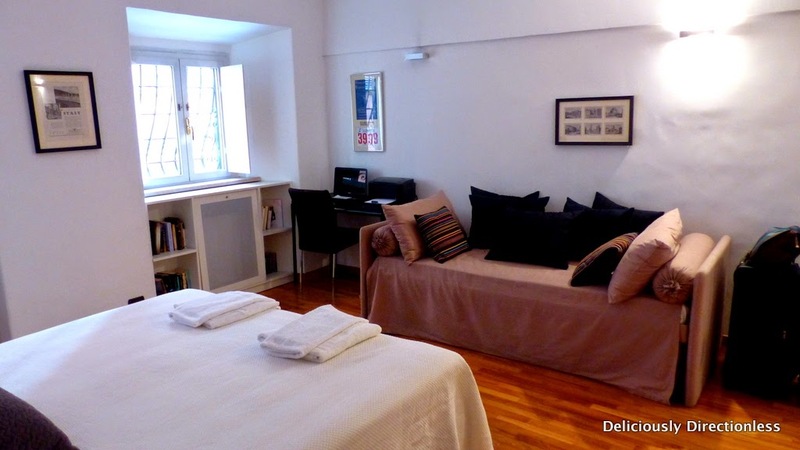 Disclosure: Our stay was organised by The Spanish Steps Apartment. Views are entirely my own. Exciting News – I’m heading to TBD Italy 2014! How does one get in touch with the apartment owner?